Yoga is a great way to balance both the mind and body. 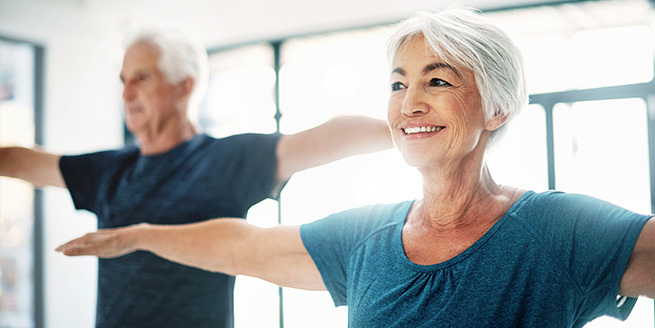 Regardless of your level of flexibility or fitness, yoga has numerous physical and mental benefits for all shapes, sizes, gender, and age: it improves concentration, mental focus, and flexibility, all while providing a gentle full-body workout. Whether you’re looking for a way to relax after work, recover from an injury, or simply to improve your overall health, taking a yoga class is a great way to get started on your goals. flexibility, and power, and continued practice leads to better overall health and sense of wellbeing. Focusing your mind as you practice strengthens your muscles as it improves your focus, and helps to quiet the mind’s distracting chatter. 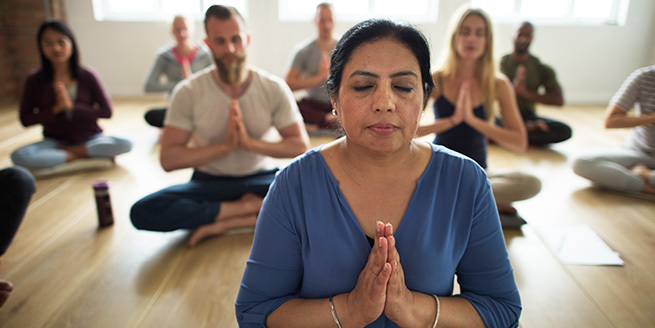 Our gym offers different yoga classes throughout the week that are good for any skill level – whether you’re an expert Yogi or are looking to take your first yoga classes in Clairemont, San Diego. Our basic yoga classes incorporate essential, foundational yoga postures while helping to introduce you to the fundamental principles of alignment and correct breathing techniques. Emphasis is placed on safety and stability within each pose. Gradually these poses will be linked together into a gentle flowing sequence. If you have never tried yoga, these are a great introduction; they’re designed to meet the needs of both those new to yoga as well as those seeking continued understanding of basic yoga poses. Each yoga class is 55 minutes. The slower pace of Gentle Yoga classes make them a great choice for those wanting a less strenuous approach to yoga. These relaxing classes incorporate deep breathing and stretching, and are incredibly therapeutic for the mind and body. Soothing music, breathing, rejuvenating postures, and deep relaxation combine for a full-body refresh. The room is kept at a comfortable temperature, and focus is kept on breathing patterns and listening to the body. These extremely accessible classes are perfect for anyone looking to develop a practice of conscious, mindful movement. Whether you’re a beginner, a world-class athlete, or a senior, Gentle Yoga is a rejuvenating, restorative experience. Gentle Yoga classes are 55 minutes or 75 minutes.